He professed faith in Christ and attended Acton Baptist Church. 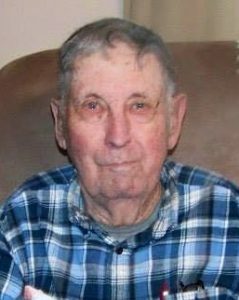 He was a veteran of the Korean Conflict having served his country honorably in the United States Army. Don was a former employee of Bourbon Cooperage in Lebanon. He was also a farmer and worked in concrete construction. He had a very competitive spirit, especially when playing corn hole and thoroughly enjoyed spending time with his family and family meals. He was a former member of the Merrimac Masonic Lodge. He united in marriage to Norma Sue Herron May 8, 1965 and she preceded him in death November 26, 2017. Don is survived by two daughters: Vickie Brock and husband, Eddie of Campbellsville and Melissa Neary and husband, David of Elizabethtown; six grandchildren: Skyler Swafford, Aaron Brock and wife, Elesha and Mackenzie Brock and wife, Jessika of Campbellsville, Chase Hubbard, Elizabeth Neary and Johnathan Neary of Elizabethtown; five great-grandchildren: Zoey, Penny, Kaylee, Hudson and Abaigail; one brother-in-law, Terry Herron of Campbellsville; one sister-in-law, Beatrice Herron of Liberty; several nieces and nephews and many other relatives and friends. He was also preceded in death by five brothers and three sisters: Roy Gabehart, Albert Gabehart, Murrell Gabehart, Colbert Gabehart, G. W. Gabehart, Lorena Wethington, Evelyn Dillingham and Irene Payne.